I’m so glad that Lincoln is moving away from its awful, alpha-numeric naming system. It makes the cars easier to identify and gives it an opportunity to pick some cool names. 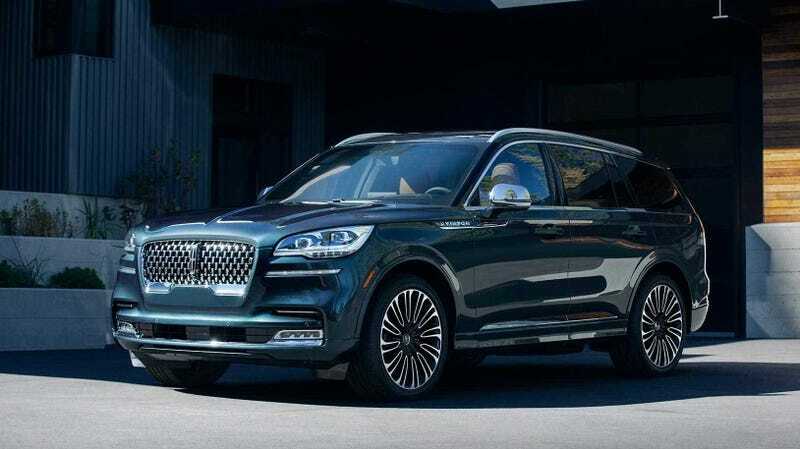 The 2020 Lincoln Aviator is armed with epic nomenclature, smooth, clean lines and an impressive 450 horsepower. These are all good things. This is the real one now and visually, not much has changed between it and the concept. We still have the flowing, simple lines. I spot a little Ford Flex in there also, which is an SUV I actually liked the look of before it was killed off. Maybe it lives on in this Lincoln. The Aviator is Lincoln’s newest mid-size, three-row SUV offering that will slot below the Navigator. Power comes from a twin-turbo, 3.0-liter V6 engine. Mated to a 10-speed automatic, it makes 400 HP and 400 lb-ft of torque. But if you get the Aviator Grand Touring, that 3.0-liter then becomes part of a hybrid powertrain. Lincoln estimates this version will make 450 HP and 600 lb-ft of torque (!) The SUV will come with a host of different drive modes (Normal, Conserve, Excite, Slippery and Deep Conditions) as well as two additional ones for the hybrid version: Pure EV and Preserve EV. The interior looks quite spacious and continues that smooth look from the exterior. Twenty-eight speakers in the cabin ensure that you can blast your music for all to hear. The battery for the hybrid is packaged beneath the floor, so cargo space isn’t affected. And of course, the car has that cool gimmick where it has six unique chime noises that were recorded by the Detroit Symphony Orchestra. These chimes are the Non-Critical Chime (door is ajar, headlights left on, fuel’s low), Soft-Warming Chime (trunk is closing, fuel door is open, parking brake engaged while driving), Hard-Warning Chime (when critical things need attention), Soft-Warning Beltminder Chime (buckle up), Hard-Warning Beltminder Chime (I SAID BUCKLE UP) and the Chime Reminder (just to emphasize other reminders). Lincoln has also given the Aviator its “Phone As A Key” technology, which sounds similar to the Tesla Model 3's keyless system. Customers can download the Lincoln app on their smartphones and use it to lock and unlock the car, open the trunk and start and drive the car. Additionally, you can use it to adjust the seating position and entertainment settings across different people who might want to drive. This phone-as-a-key thing was something I disliked most about the otherwise very nice Model 3. It’s not clear if the Aviator will come with an old-fashioned key fob option, but that’s the one I’d go for. The Aviator also comes with a host of driver assistance features, like assists for reverse braking, active parking, evasive steering and traffic jams. And the car uses its cameras to “see” the road and adjust its suspension if there are potholes or bumps in the way. No price was announced at this time, but this is a damn swanky SUV.